It is a well known fact that most cats do not like having a bath at all. Therefore, it can be a traumatic experience for both you and your cat, who will wriggle and sometimes scratch or bite in desperation to get free. 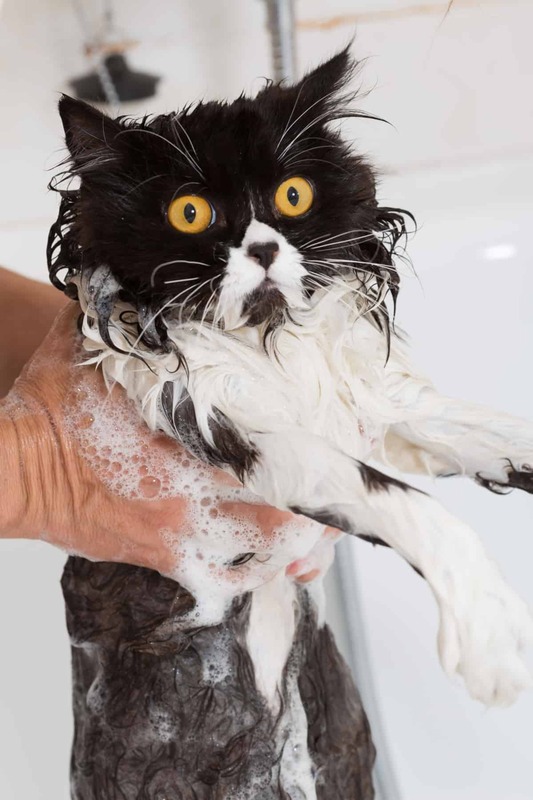 So, what is the best way to go about bathing your cat? (first tip – start when they are young – a kitten) We have compiled a list of helpful tips to make the process as enjoyable as possible for both you and your feline friend. Do Cats Really Need a Bath? 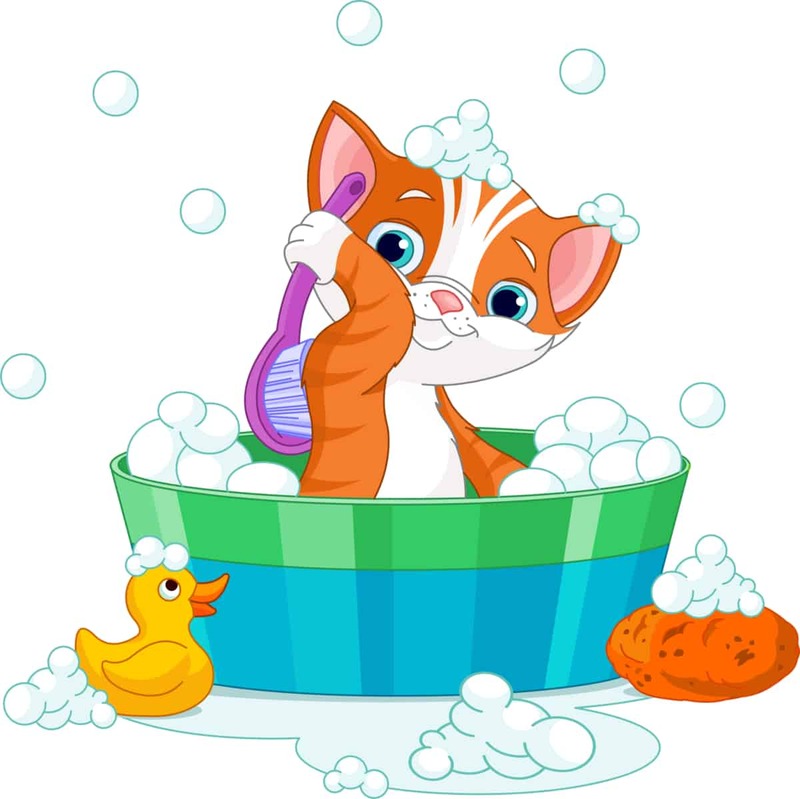 Thankfully cats do not need regular baths as they do a pretty good job of keeping themselves clean (50% of their time that’s what they do) . Their tongue has a specialized rough surface which they use to lick and groom all of their body, efficiently removing loose hair and dirt. They are also very flexible, and can maneuver into all sorts of yoga like poses to get to those hard to reach places. However, sometimes your cat might need a bit of extra help. He might have made a mess in the litter tray, walked through something smelly outside or even accidentally gotten something potentially toxic on his hair such as paint. Some cats may also need bathed regularly under the advice of their veterinarian, if they have a skin condition. Ideally you should spend some time building up to the full bath experience. We know this isn’t always possible, especially if your cat has suddenly come in from the garden smelling very whiffy. However, starting slowly will make the whole process a lot easier. Firstly, make sure you are confident and comfortable handling your cat. You can start by brushing your cat daily and learning to pick him up for a quick cuddle. From there you move on to using a soft cloth dampened with lukewarm water to slowly wipe down your cat’s paws and face. Working the way up the legs towards the trunk. This might take a few days or even a few weeks until your cat is fully comfortable. Your cat’s sharp claws are great weapons for hunting but not so great when he uses them on his loving owner. 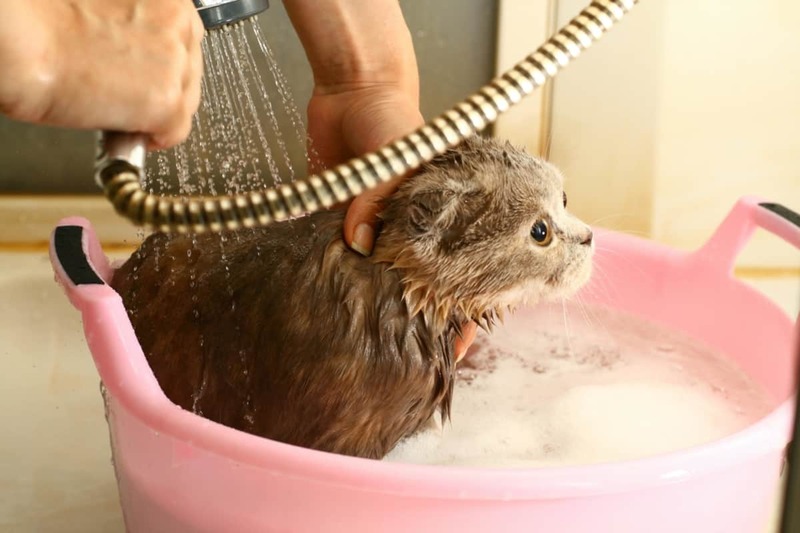 Although most cats won’t mean to injure their owner, they can easily cause harm if they are distressed while trying to escape from a bath. To make it safer for everyone, you might need to schedule his next bath after his claw trim. Having everything you need ready will make the whole process less stressful for both you and your cat. Ideally you want to bathe your cat in a closed, warm room. Close the doors, so if your cat jumps and escapes from your hands you can quickly retrieve him. Drafts of cold air after a bath will make your cat feel very cold, so try to do it somewhere nice and warm. The bathroom might be a good choice, or the laundry room if you have one. When you have everything ready, what do you do next? Place the non slip mat or a folded towel in your bath place of choice. This will help prevent your cat sliding and allow your cat to sink it’s claws into something other than your hands. Add a few inches of lukewarm water to your bath (plastic tub, sink or bath). The water should just cover the paws and part of the legs. Continue to give your cat lots of praise and reassurance the entire time. Dampen your cat’s coat using a sponge. Lather a little bit of shampoo into the dampened coat. Avoid putting shampoo on the face or in the eyes or ears. Use a sponge or cup to thoroughly rinse the coat with clean, lukewarm water. Do not pour water over the face or inner ears. Pick your cat up and out of the bath using a large, soft towel. Gently rub your cat all over using the soft towel. After rinsing, your cat may want to shake a lot, it is the easiest way to get rid of excess water- so let him do it if he wants to. Offer your cat some treats as a reward and distraction while you towel dry him. It is best not to use a human or dog shampoo; they may be too strong for your cat’s skin or even cause a skin reaction. Using a human shampoo, will often cause the cat’s skin to dry out, which could cause skin flaking. Ask your veterinarian for advice on a cat friendly shampoo if you are unsure. Choose a mild cat shampoo free from harsh chemicals or perfumes. An unscented brand of shampoo is important. Cats have a very strong sense of smell, and can find many strong new scents quite repulsive. It is important to avoid soap and water around the cat’s face. We all know how painful it is to have shampoo in our eyes, and it would be equally if not more distressing for your cat. You only need to use a slightly damp sponge or washcloth on the head area instead. Always keep one hand on your cat while you are bathing him. It can help to place reassuringly gentle pressure on the back of the neck area, while you lather shampoo into the coat or use a cup to rinse him with the other hand. Recruit a helperif possible. Bathing your cat will be much easier if you have help. 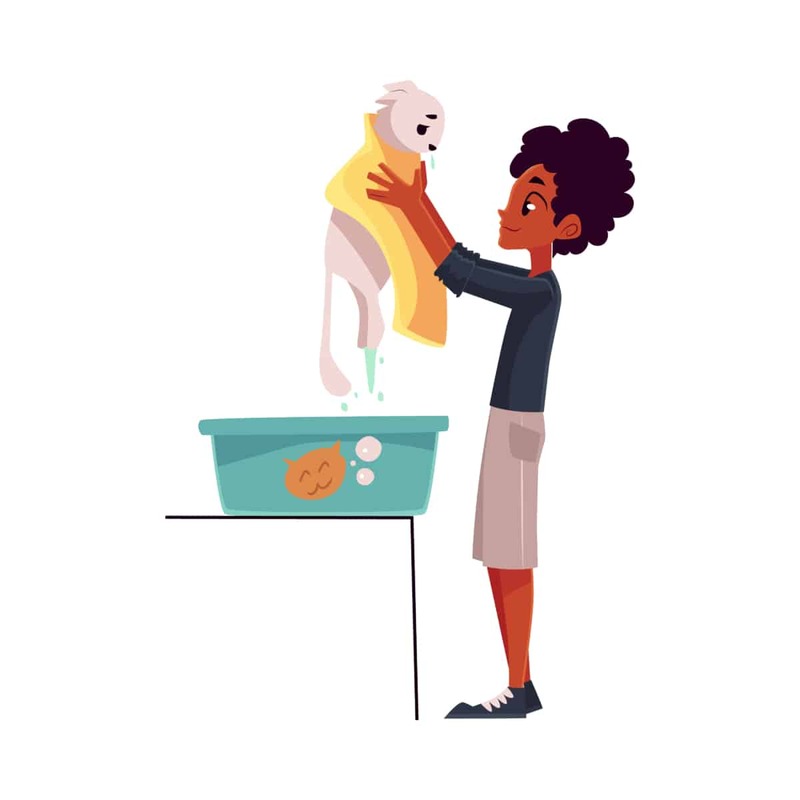 One person can gently restrain the cat, while the other quickly washes and rinses him. Dry your cat in a closed, warm room and keep your cat inside until he is completely dry. It can be tempting to want to use a hairdryer on your cat, but don’t do it. Apart from being quite frightening for most cats, a hair dryer can easily burn your cat’s delicate skin. Unfortunately, sometimes bath time might not go quite as you envisaged. If your cat is feeling scared or stressed and is struggling against your restraint to the point that you might get scratched or bitten- then it is best to let him go. Don’t fight with your cat, as you will make him fear the bath even more. Try to calm him down, offer a reassuring back rub and try again. If all fails, then try to wipe him down with a damp sponge instead. 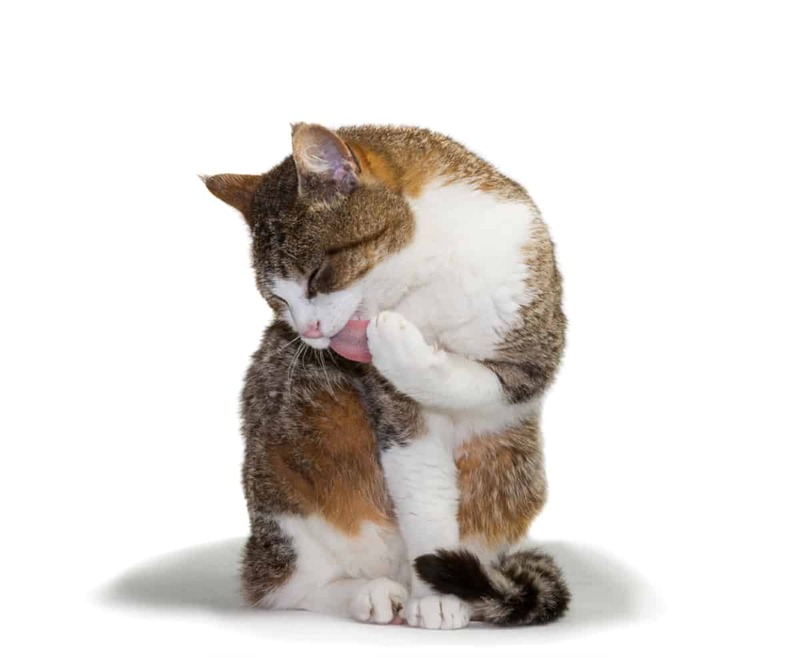 Cat bites and scratches are well known for causing infections. Therefore, if you are bitten or scratched it is best that you seek medical advice. Although you might relish in the thought of a long, leisurely bath to relax, your cat definitely will not. However, the good news is that many cats can with time, patience and preparation learn to tolerate (or hopefully enjoy) a quick bath. 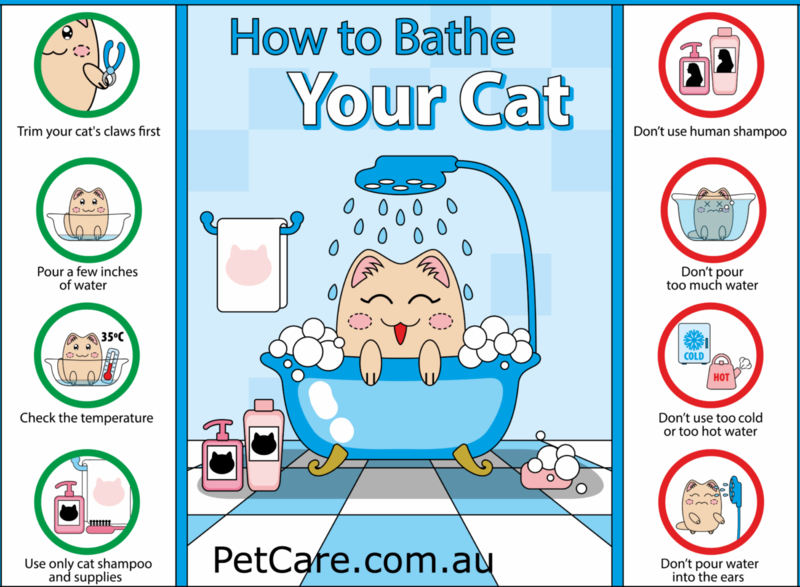 Hopefully our helpful tips for bathing your cat will make the next bath much more enjoyable for you both (and without injuries! ).